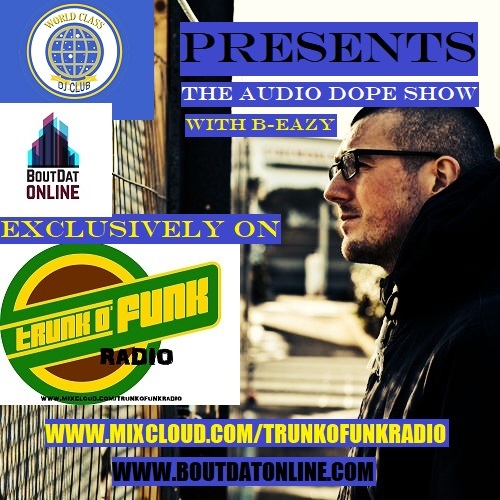 The World Class DJ Club proudly present the debut episode of their new monthly online mix-show, ‘The Audio Dope Show’, exclusive to TrunkOfunk Radio’s Mixcloud channel!!! Hosted by United Elementz and Bout Dat Music’s very own, Jersey Hip-Hop artist/promoter, B-Eazy!!! Featuring tracks from Skepta, Sean Price & Small Professor, Papoose & DJ Premier, Christian Foley, Insane Clown Posse and a special United Elementz 5th anniversary mix featuring Jersey Hip-Hop classics from Eddy West & BJ Myles, J-Fab, Kinz and more!! !